Why is it that so many people don’t know what vitiligo is? How many of us learn about vitiligo after the fact, after our diagnosis? Vitiligo isn’t common knowledge. It’s one of those things we all must confront as we consider the ramifications of a small little spot of depigmented skin that will most likely grow. Even with people like Michael Jackson, Lee Thomas and the model Chantelle Winnie, many people don’t know what vitiligo is. It takes one of us, those with vitiligo to talk about vitiligo. And that can be very hard to deal with. …the findings of Congress that vitiligo is a disfiguring, inheritable disease which cripples the personality of individuals suffering from it and which afflicts about three percent of the U.S. population. Provides, under the Public Health Service Act, that the Secretary of Health, Education, and Welfare shall carry out a program to develop information and educational materials relating to vitiligo and to distribute such information and materials to persons providing health care and to the general public. Who was Parren Mitchell and why did he care about vitiligo? 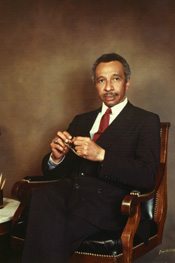 Becoming the first black congressman from Maryland in 1971, being the first black person to attend graduate school at the University of Maryland and being a member of the Congressional Black Caucus, Rep. Parren Mitchell was a leader of the Civil Rights movement and at the forefront of efforts to help minority owned small businesses. Civil Rights, anti-poverty, minority business owners, a World War II hero awarded the Purple Heart, and vitiligo awareness. And that’s just highlights of this man’s life. This is what everyone with vitiligo asks for: to be judged by the content of their character not by the colors of their skin. And vitiligo is particularly noticeable with dark skin tones because of the contrast. Being a champion of those that society too often ignores, Rep. Mitchell fought for almost ten years to have federal funds earmarked for vitiligo research. Vitiligo “cripples the personality of individuals suffering from it” wrote Rep. Mitchell. He sought to better our understanding of a disease that changes skin tones, changes perceptions. Rep. Mitchell recognized what those of us with vitiligo know all too well: vitiligo can be crippling to our sense of self. And people with vitiligo need help. But what kind of help do we need? That’s something we will cover in part two. And what do you think? Is vitiligo awareness a civil rights issue? Vitiligo is not just a black persons disease, I am white and also have it, granted in the winter months it is not as notisable it still as just as degrating in a white person. so stop acting like this only effects black people. I don’t see how or where he acts like Vitiligo affects only black people. Maybe it appeared to you as such because this article is about black congressman who himself has Vitiligo and because he mentions three most known black people who have this skin condition. The fact is that Vitiligo is much more noticeable on person with dark/darker skin complexion, that’s all. It’s a bit “easier” for white people only because their skin is already light so it’s harder to notice (at least at first glance) vitiligo patches on their skin. Yes I agree, I am white and also have vitiligo. I got it around the age of 14, and it took me forever to finally be comfortable with it. It isn’t just a black persons disease! And there is absolutely NO ONE in my family that has had it…so it’s very confusing! He never said it “only effects black people” … Unless I’m missing an entire part of the article. Rather than get defensive , why don’t you read closer? It is more noticeable on darker completed individuals for obvious reasons. And if you read closer , you notice the congressman was not just fighting to bring awareness to vitiligo in the African American community ; he was fighting to bring awareness about vitiligo period. Thank you so much for this very instructive article! I didn’t know about this at all and it is so important – in several aspects: Vitiligo awareness and research, history – namely Black History, and for mentioning Michael Jackson – who was the most vilified person suffering from Vitiligo, brutally attacked and accused for bleaching his skin on purpose because the media didn’t want to believe him. I look forward to the next part(s)! My daughter is 15 Latina and her Vitaligo manifested itself at 8. It’s been a struggle with her self esteem but she has finally become comfortable in her skin. I wish people were not as cruel as they are. Education and awareness would be nice. I also have vitiligo notice it when I turned 42 years old. I don’t know anyone in my family that has it either, but I begn to get ill due to low iron deficiency, I had an iron transfusion and then began to notice spots on my hand. I went to see a dermatologist and without even knowing I was having issues with my blood the first thing he said” to me was it could be Hereditary or it could be due to some type of autoimmune deficiency so that’s what I took it as because my iron was so low I began passing out, which is why I had to have the iron transfusion. I have had vitiligo for more than 40 years. The disease becomes part of who you are. It changes you in every way. I can deal with the disease now but it took most of my life to come to terms with it. But I still have the memory of who I used to be before I acquired vitiligo. And the memory of the things you lose from having this disease. What happens to you on the outside with this disease is only what you see. It is what’s going on inside your soul that’s so devastating. This disease is not Life threatening at all………. But it is extremely Life changing. I can say that I am a totally different person than I was before acquiring this disease.